Need some type inspiration? We reveal the font pairings that were just made for each other. Finding font pairings that set each other off, don't fight the eye for attention, and harmonise without becoming homogenous and dull is an art. The age-old rule goes: concord or contrast, but don't conflict. But with so many professional typefaces and free fonts to choose from, how do you find two that work in harmony? Read on for our pick of the best font pairings – or jump to the end of page 2 for some top tips on finding your own. Alegreya is a super-family that includes sans and serif sister families alongside this small caps version, designed by Juan Pablo del Peral for Huerta Tipográfica. The family has a slightly calligraphic edge, and is designed to be suitable for long blocks of text. However, the small caps variant is best suited to headers. We suggest pairing it with Source Sans Pro, Adobe's first open source typeface family, designed by Paul D. Hunt. If you're aiming for a professional look, this is a great font pairing to try. Julius Sans One works only comes in one weight and is an all-caps font, but it's a top choice for a display font, with its fine stroke and broader baseline. The more geometric Archivo Narrow is a perfect match. It has been designed to work equally well in print and digital. Display font Playfair draws inspiration from the period in the 18th century when quills were being replaced by pointed steel pens. This, alongside printing developments, led to high-contrast letterforms with delicate hairlines becoming popular. Elegant sans serif Raleway makes a perfect font pairing. Oswald was launched in 2011 as a reworking of the 'Alternate Gothic' sans-serif type style. It makes a great pairing with Lato (which translates as 'summer' in Polish), a warm yet stable sans serif. Both are available in a range of different weights and variants, making this font pairing nice and versatile. The ever-popular serifed Minion Pro works perfectly as a headline font when coupled with the nimble sans-serif Super Grotesk for body copy. Together, these fonts create a modern sense of effortless elegance. These two libre typefaces make a great font pairing if you're after a traditional feel. Both Libre Baskerville and Libre Franklin have been optimised for use on screen. The former is nice and readable, so ideal for use as body text, while the latter is better suited to headlines. Nine different weight options make it nice and versatile. Working within superfamilies makes it easy to find harmonious font pairings. GarageFonts' Freight is a great example. It's available in a large range of weights and styles, including Sans, Text, Display and Micro versions – giving you a versatile typographic toolkit to work with. If you're after something more unexpected, how about this duo? The flowing stylings of Kaufmann add a touch of handwritten flair to this odd couple, and offset the straight and angular sans-serifed NeutraDemi perfectly. This font pairing might not be the most obvious match, but that doesn't stop them playing off one another beautifully. Due to its versatility, the reliable Minion Pro appears a few times in this list. This time it's playing second fiddle to the bold and attention-grabbing Brandon Grotesque. This is a classic serif and sans-serif font pairing, with both typefaces remaining crisp and easy to scan in any page layout. When creating Josefin Slab, designer Santiago Orozco wanted something between Kabel and Memphis, but with modern details. The final typeface has distinctive, typewriter-style details, and is ideal for use in headlines. Combine it with body copy in Patrick Hand for a font pairing packed with character. The latter, based on the designer's own handwriting, has a neat, friendly vibe. This is a famously harmonious duo, combining ubiquitous Neo-Grotesque sans serif Helvetica Neue for headlines with the classic Old Style serif Garamond for text. Mix up different weights and sizes between the two neutral families to establish hierarchy within your designs. Another classic font pairing, this time between an 18th century Old Style serif and a late-20th century Humanist sans serif. Myriad is famously used in Apple's corporate communication, as well as in the Rolls Royce logo. 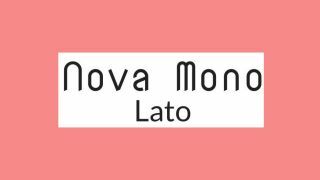 Nova Mono is only available in one style, but that style is ideal for making a statement. Pair it with versatile sans serif Lato to stop things getting too crazy. Lato designer Łukasz Dziedzic wanted something that was nice and clear at small sizes (as we'd suggest using it within in this font pairing), but revealed some stylised effects when used larger. Time for another superfamily, this time from Dutch foundry exljbris. Fontin has been designed specifically for use at small sizes, and features loose spacing and a tall x-height. Fontin Sans makes an ideal partner for it. Two typefaces both have plenty of personality, but bond perfectly. An Old Style serif typeface, Minion was designed in 1990 but inspired by late Renaissance-era type. Although technically a sans-serif, Poppl-Laudatio's subtle flared details give it a quirky edge. Superfamily Liberation was intended as an open-source substitute for many commonly used Windows fonts, such as Arial, Times New Roman and Courier New. The Serif and Sans versions make a smart font pairing, but there are also other variations to play around with, including Sans Narrow and Mono. This pairing is particularly effective when Trade Gothic is used in its Bold weight for headlines, to set off Jan Tschichold's classic Old Style serif face for text. Both typefaces are highly readable, with a tall x-height, and combine well together to give a pleasing effect.